During my recent trip to the Portland International Airport for a trip to Los Angles, I took pictures of the three Red Line stations that only serve the Red Line to the airport. Unfortunately I was using a borrowed point and shoot which did not have the quality of my DSLR but the pictures will have to do. For these stations along with many others I plan to photograph soon, I will document what the existing conditions are, what the zoning is, what the plus and minuses of the station are, and what can be done from an urban design standpoint to make the station a better place now and in the future. 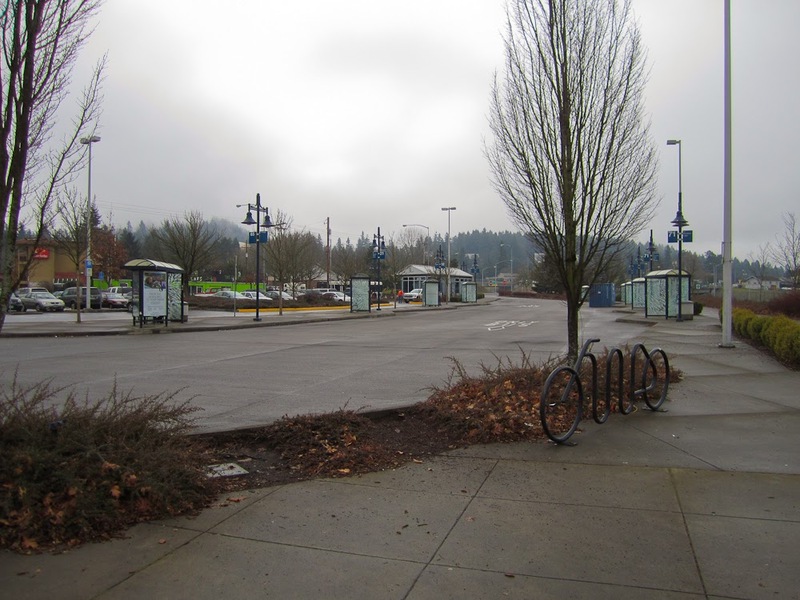 First up is the Parkrose/Sumner Transit Center which is the perfect example of why freeway based rail transit stations just don't work especially when all the conditions this one faces. That is not to say it is not a popular transit hub as it does serve several important bus lines but because of the freeway location will never be all it could be. 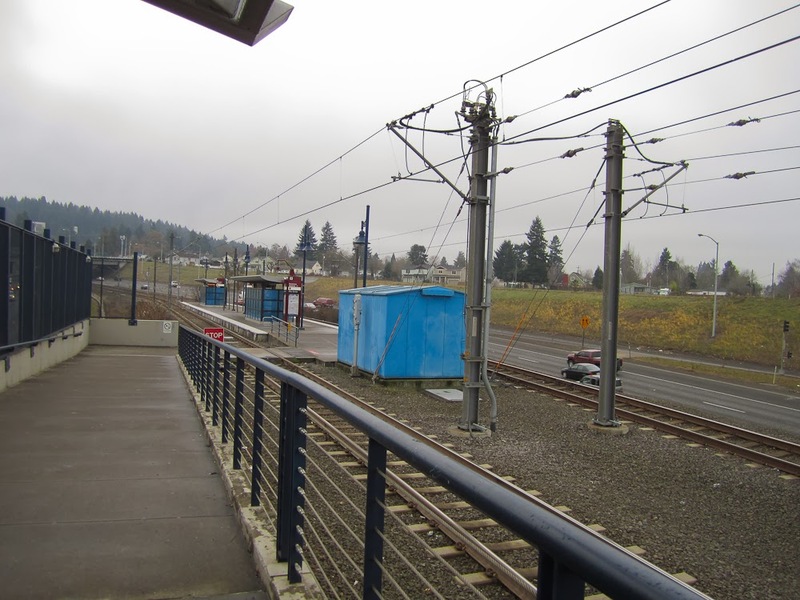 The transit center sits along Interstate 205 between Sandy Blvd on the south and Killingsworth on the north. To the east of the transit station is a dual branded Quality Inn/Rodeway Inn which I will discuss later. The transit center is served by Trimet Routes 12, 21, and 71 along with a C-Tran route 65. Here is a MAX train leaving toward the airport. The bridge across the freeway is directly to my right along with the transit center. 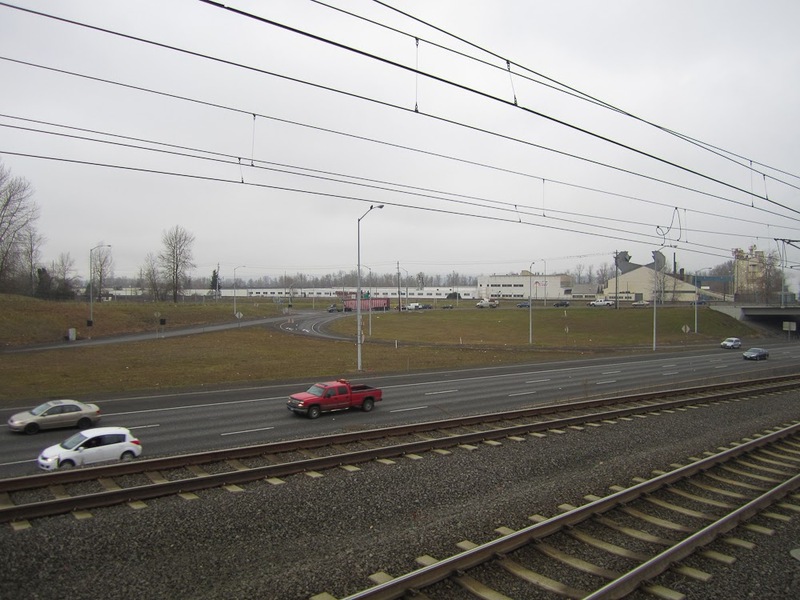 The train is about to duct under Killingworth with is a vital link to the industrial areas of Portland around the airport and North Portland. Here is the bus bay area of the transit station. It seems that many transit stations and simply overbuilt and this one seems to be no exception. Currently several of the bays are not being used (one of which has a storage pod). Do buses truly need all of this area or is it another example of we build things because that is the way it is done. Across the street from the edge of the Transit center is an Econolodge Motel. However, it is clear that crossing Sandy Blvd is not that pleasant of an experience especially at the speed many drivers go through this area. 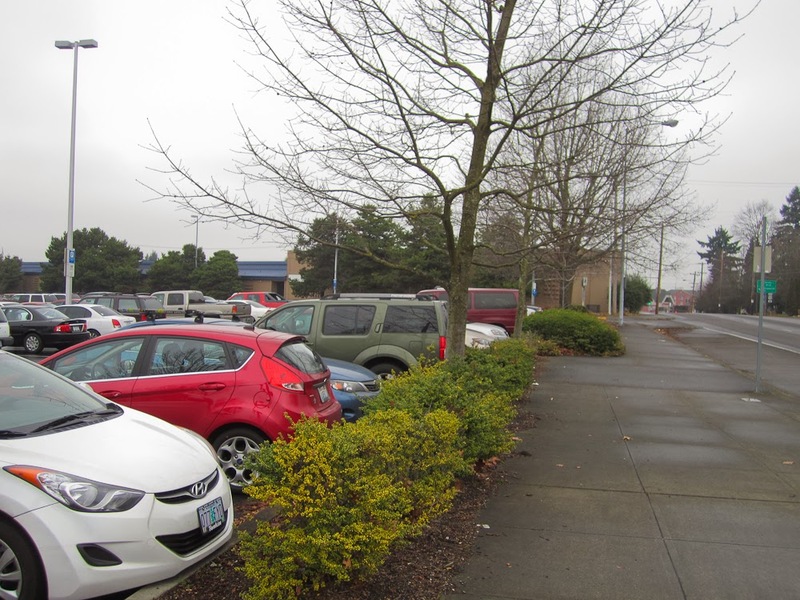 If you want to access the Quality Inn/Rodeway Inn that is located adjacent to the transit center you have to walk out of the transit station, head down Sandy Blvd onto a sidewalk that does narrow significantly to reach the motel office. The facility itself is typical auto oriented 1970's era mid range hotel. This shot is looking west along Sandy Blvd toward the Interstate 205 overpass. As you can see there is a large bus layover zone along Sandy Blvd which even more reason why the bus bay section of transit center is severely overbuilt and could be downsized. At this particular moment traffic is not bad on Sandy Blvd but there don't be fooled, Sandy Blvd can be extremely busy further making it a unpleasant environment for pedestrians. These next two pictures show the access ramp from the bridge over northbound Interstate 205 and the west side of the freeway. As you can see those who live on the west side of the interstate do not have any easy access to the MAX line. 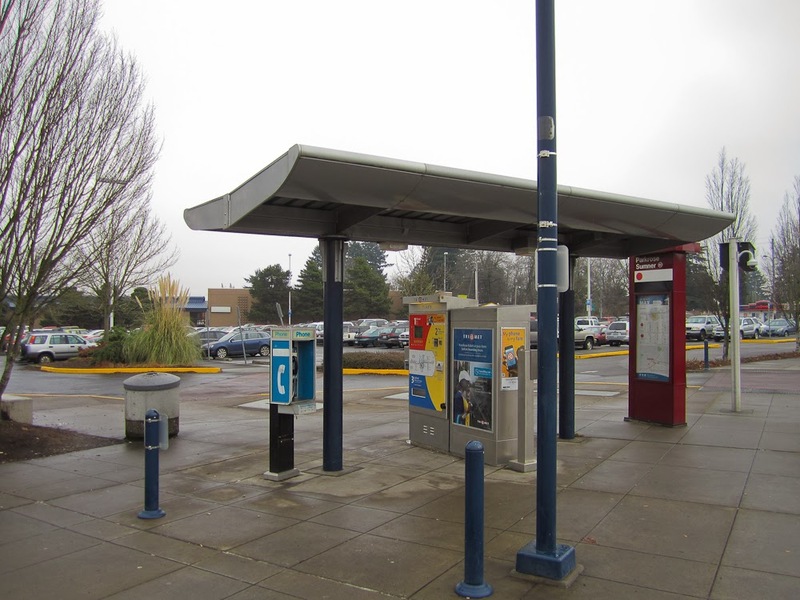 The area to the west of Interstate 205 does not have access to the transit station without walking down Sandy Blvd. Looking north of the MAX station you can see Killingworth which is a major industrial corridor from here North Portland. These next couple of pictures further emphasis what a poor environment freeway transit stations are and why they should be avoided unless there is no alternative. Here is map created by Portlandmaps.com that shows the zoning in the area. 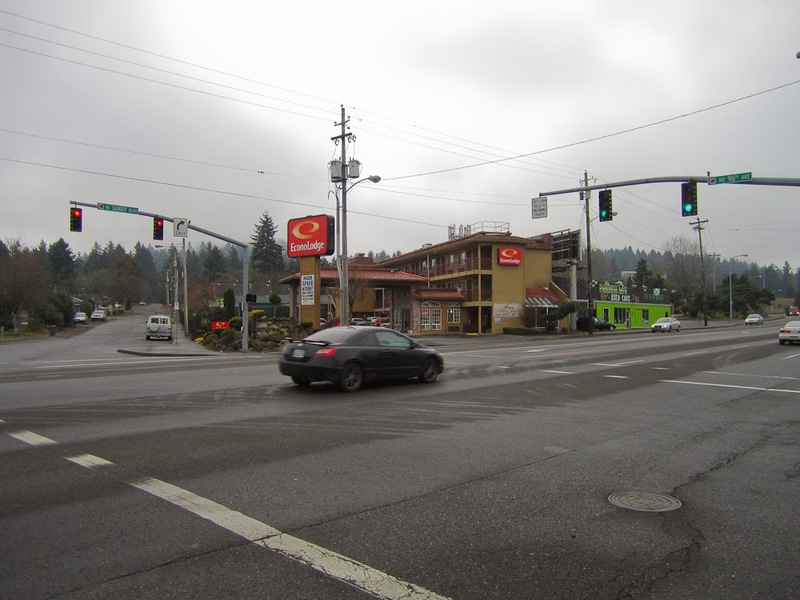 The area to the east of the station is largely commercial which continues down Sandy Blvd. Across the Interstate from the transit station you have higher density residential which as noted from the pictures has very poor access to the MAX platforms. The (h) destinations indicates airplane flyover overlay zone which restricts the height of buildings because of their proximity to Portland International Airport. The question we have to ask is what can be done to this area from an urban design standpoint that will make this area a better place and more vibrant. 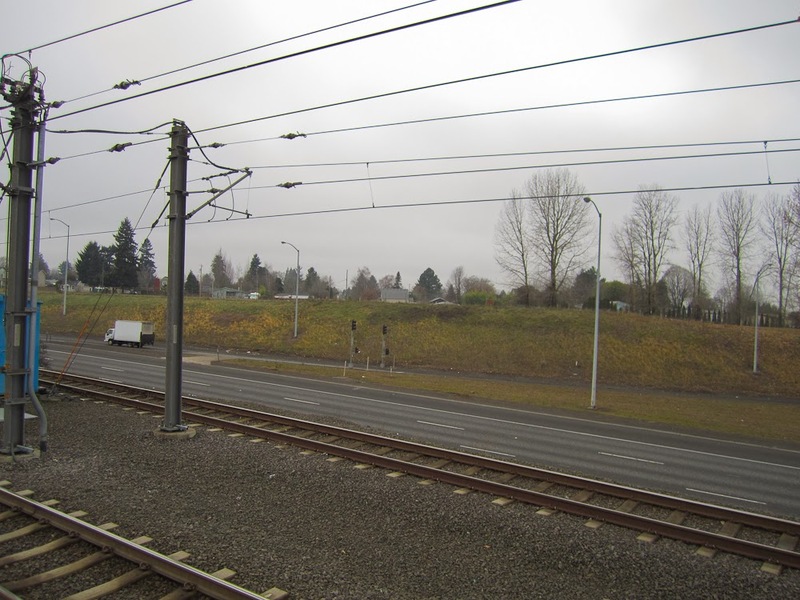 One thing that cannot be changed is the fact that the MAX station is in the median of Interstate 205. 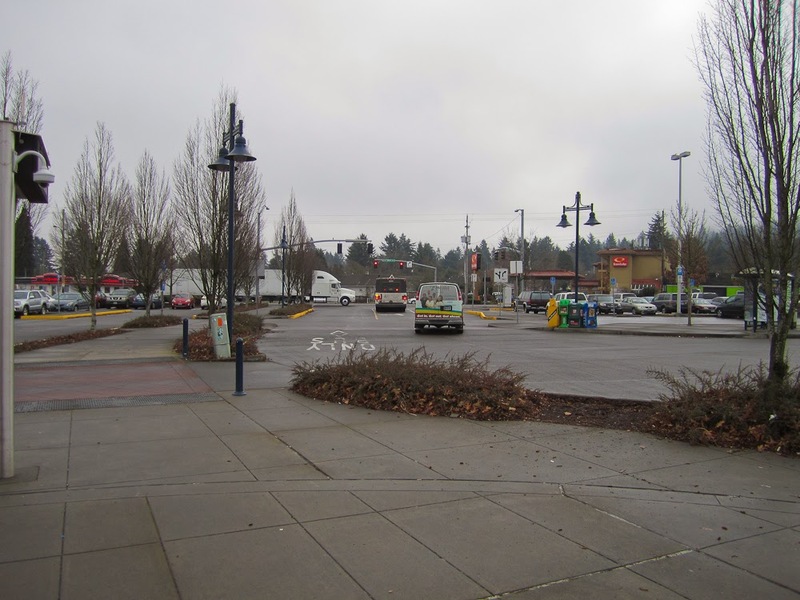 It has been stated many times that a freeway is the worst possible place to put a transit station and the Parkrose/Sumner transit station proves the point. 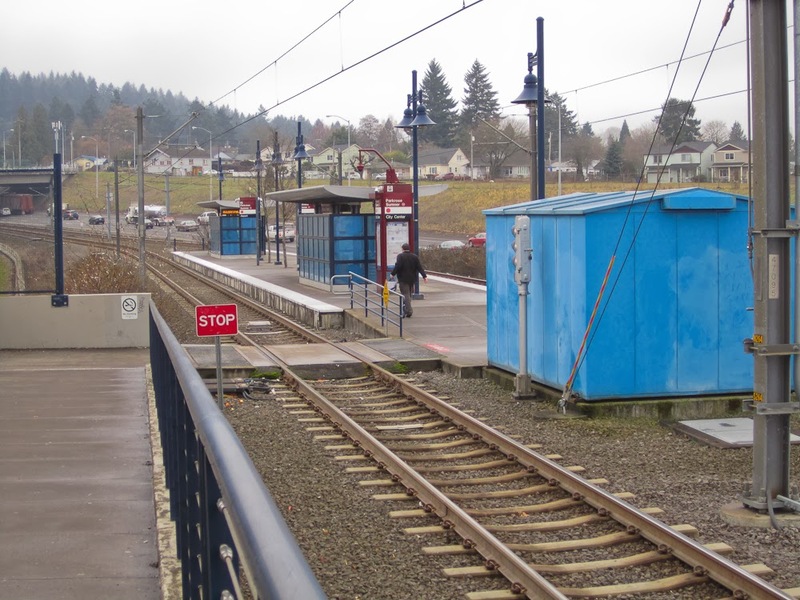 However, whats done is done so how can the transit station be improved. 1. 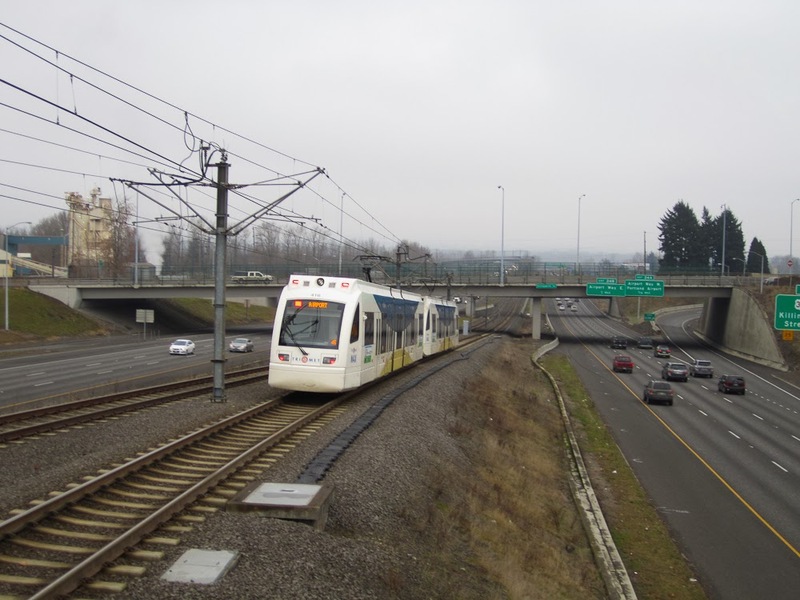 First, a second bridge should be built that crosses the southbound section of the freeway and connects MAX to the west side of the freeway allowing much better access to the transit station from the neighborhoods to the west. 2. Another idea to make this a better station is to rebuild the bus area to make it less intrusive. While it is complicated by the fact that buses do have to make a tight turn in this facility, there is no reason why the bus facility could not be downsized while still leaving space for future expansion. 3. Work with the owners of the hotel to eventually blend the hotel facility into the transit center. This could be done either through incentives or tax breaks. The hotel is missing a major marketing opportunity by not promoting its hotel to those using MAX. I see a lot of visitors using MAX but most pass this hotel and head directly to downtown. 4. Improve Sandy Blvd to make it a more pleasant area. Currently Portland is tapped out on Tax Incriminate Financing Districts (TIF) to improve the area plus the limits placed on the area because of the airplane overlay zone. However, there is still other funding mechanisms that could be use to make Sandy Blvd a more pleasant street to be a transit rider. 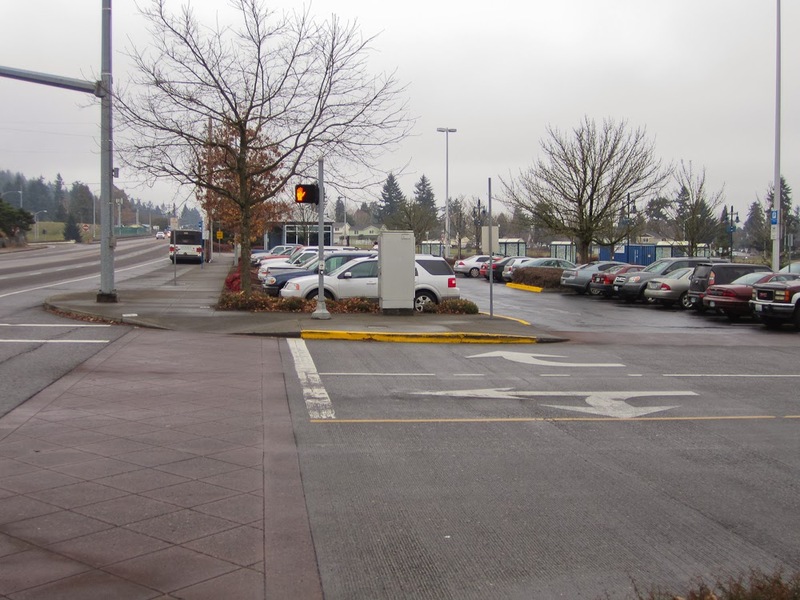 Frankly, there is little hope at the present time for this transit center for a multitude of reasons. However that does not mean that little changes cannot be made to make it a better urban environment than currently exists. Sadly Portland current has too many areas (especially on the east side) that need attention with little funding to make it happen. In the future I plan to do overviews of more transit stations to show what the current conditions are and what can be done from an Urban Design standpoint to make them a better place.